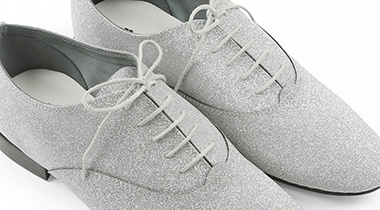 The STAR material, exclusivity and novelty of this season, comes to play with the movement to bring light thanks to this silver glitter leather that can be found on the iconic models of the House. 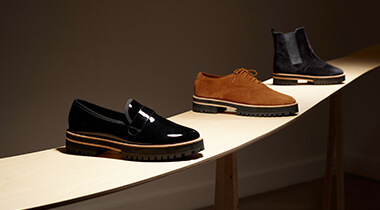 The COUNTRY line, offers two new models perfect for the city, distinguished by their crepe sole and beveled heel. Ideal models for this winter, as well as the new JABBA of the PUNK line with its patent leather and lace ribbon reminiscent of the dancer’s pointe shoe. For the leather goods, two new lines are in the spotlight: COURONNE and DUO. 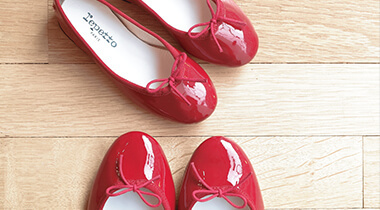 With the COURONNE line, Repetto enters into modernity. The round shape of the models evokes the movement formed by the dancer's arms. The DUO line is characterised by duality: removable knot and an articulated ring allows two interpretations of the bag. Repetto pays tribute to femininity with her alliance of four very sophisticated materials of the Maison: The Box for its brilliance, velvet for its personality, the calf for its strength and finally the lamb for her flexibility. For the Athleisure collection of this winter, the light comes into the movement and slips into a hypnotic game of lines, reflecting the outlines of the body. In the performance line, the high Stretch mesh, with multiple benefits, draws a silhouette without any imperfection. Pure design pieces define the Lifestyle line of this collection. A technical mesh emphasizes the structure of the body and expresses a modern and graphic look.